The North Fork Cutoff trail is a quick and easy one. This trail follows the North Fork of the Animas River from the ghost town of Animas Forks to the start of the Engineer Pass trail. 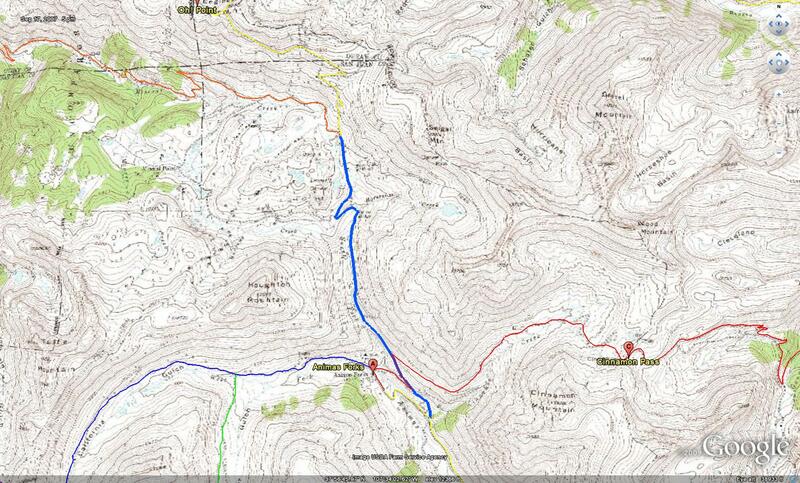 This route is mainly used as a quick connector to get from Animas Forks to Engineer Pass. This is also a good route if you would prefer to skip the rougher Mineral Creek trail but would like to get to the start of the Engineer Pass trail. Even though this section of trail is just under 3 miles long, the scenery is great! Please feel free to leave your comments and post your pictures from the North Fork Cutoff trail below. Escalante Canyon is a nice easy drive that takes off from US 50 just north of Delta, CO. The scope of this trail writeup starts at the highway and ends at Escalante Forks, where there is a Y-intersection to the Love Mesa and Palmer Gulch trails. The entire length of this section of road is maintained and easily traveled by any vehicle. From the highway the road quickly drops down and crosses the Gunnison River. After crossing the bridge, the road crosses private property for a few miles before finally reaching public lands. There are a number of marked campsites along this section of the road. While this trail offers no obstacles, the scenery in the canyon is great and there are a few old historical houses to check out. The first one is the Walker Cabin which was built in 1911 by Harry Walker. A little further up the road you will reach the cabin built by Captain Henry A. Smith against a large rock slab. Take your time to explore these structures. Please feel free to leave your comments and post your pictures from Escalante Canyon below. Interest in the Dolores Triangle route from Grand Junction to Moab is becoming very popular with people wanting an alternate route to Moab instead of staying on I-70. Before planning to take this route to Moab, be sure to do your research on the Dolores River crossing. During the spring and early summer, chances are good that this crossing is not drivable. Your best bet to make it across the river crossing is the late summer and the fall. 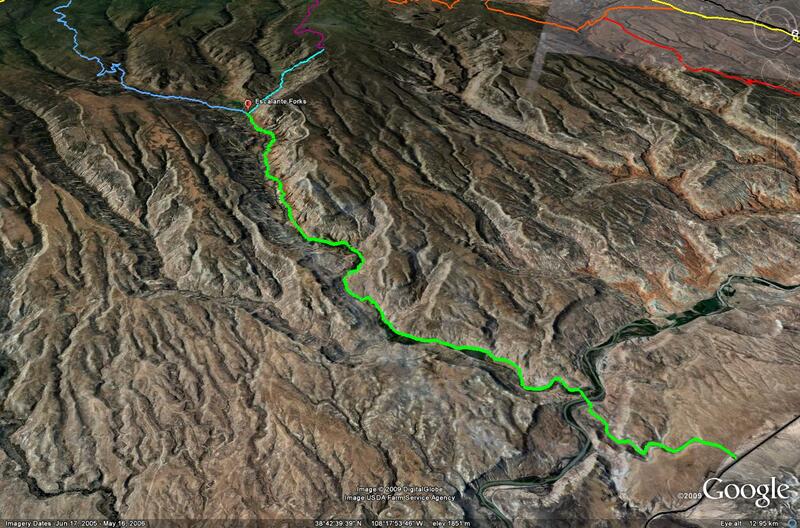 For real-time water data for the Dolores River near the crossing, check out this USGS website. 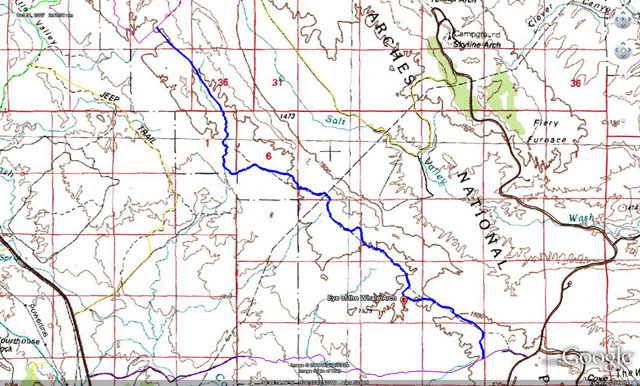 If you would like to travel part of this route when the river is flowing too much to cross, you could also look into the Sheep Creek Route as another option. 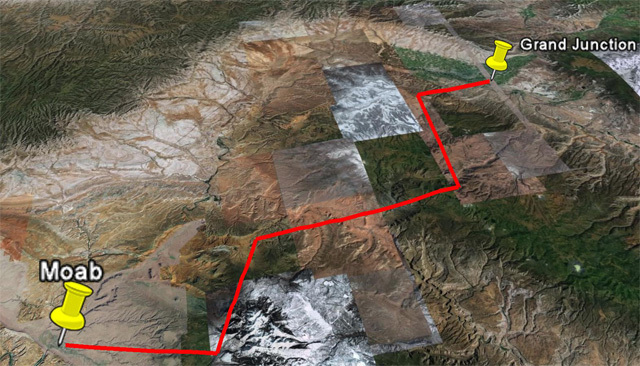 This route starts out in the Colorado National Monument on Ds Road which you will follow to the Utah state line. From this point you will be following the maintained Dolores Triangle Road all the way to the Dolores River. There will be a couple of intersections in the road, but the main ones are marked and easy to follow. Just make sure to follow the markings to the Dolores River ford. Once across the Dolores River you will meet up with the Entrada Bluffs Road. From this point you have a couple of options. If you want to head straight to Moab, take a right hand turn and make your way to Highway 128. The track provided below takes a left turn onto Entrada Bluffs Road and follows the Kokopelli Trail to the La Sal Loop Road. If you are planning to head this way, beware that you will need to descend Rose Garden Hill, which can be difficult for stock vehicles. Once past Rose Garden Hill, you have one more choice. You can take a left onto Onion Creek and head back down to Highway 128, or you can turn left and continue following the Kokopelli through Thompson Canyon and on to the La Sal Loop Road. 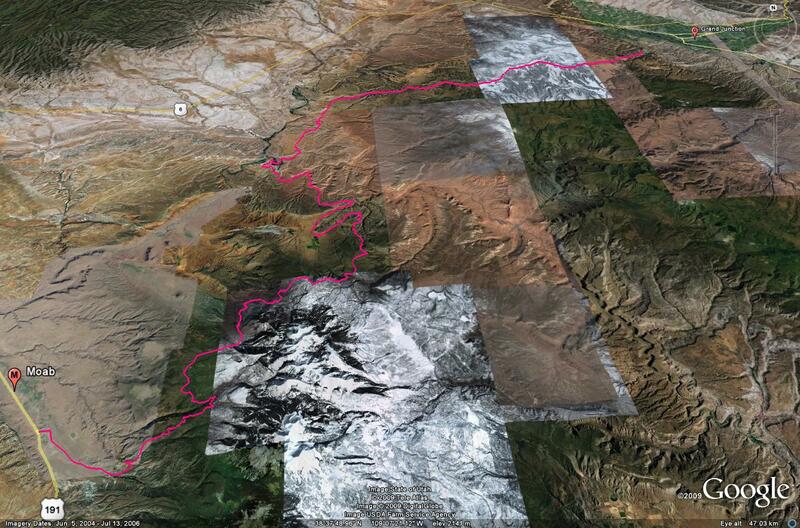 The tracks below are a long version of the possible routes you can take once crossing the Dolores River. In the future I may be adding some alternate routes to help you plan, but in the mean time you can use my other trail specific pages for Onion Creek, Polar Mesa, Sand Flats Road and Thompson Canyon. If you have any questions, suggestions or comments about the Dolores Triangle Route from Grand Junction to Moab, please feel free to post them below.